Keeping a healthy environment, may it be in the office or in the home, is always a top priority. We make sure to tidy up things and keep away the dirt and dust for a more pleasant ambiance at all times. 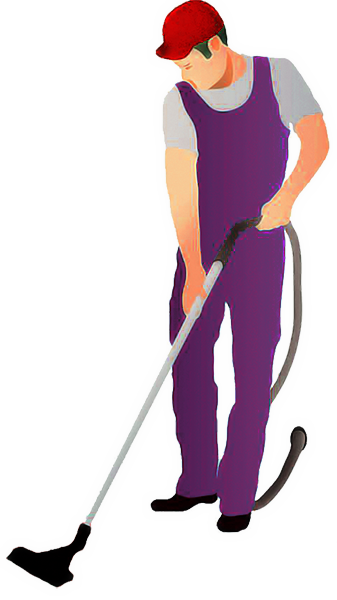 One of the best and reliable buddy to help you get through that cleaning job with much ease is a central vacuum system. It is, in fact, an innovative solution that is becoming an essential part of every household. We are already used to the heavy work of vacuuming. The traditional way of doing this is by carrying or moving a whole vacuum unit from one place to another and seeking those hard-to-reach areas where debris and accumulated dust should be sucked away. Well, in terms of conveniences, there is always something more to come and here in vacuum industry; central vacuum system is the name of that convenience I suppose. With the help of a central vacuum system, vacuuming will be so much easier and faster. Unlike the traditional upright vacuum, a central vacuum system includes tubings installed within walls or floors of your house so you won’t be burdened by carrying a heavy vacuum equipment around the house and office. These tubings or pipes are connected to inlet valves (these are small holes installed in walls and floors where you connect the vacuum hose and bring in the dirt and debris). You decide on where the inlets should be placed so you won’t be troubled reaching those challenging nooks of the house. The vacuum unit itself is tucked out of place. You simply insert a light-weight vacuum hose into these inlets and the vacuum system automatically turns on. Compared to the traditional upright vacuum, the central vacuum system is very convenient to use, durable, reliable, does not produce bothersome noise and is a healthier cleaning approach. To help you find the perfect central vacuum system for your home, we have summed up our best picks for you. The Honeywell 4B-H403 Central Vacuum System Power Unit is a powerful cleaning tool equipped with sturdy components that deliver solid cleaning performance. You can clean a 3,000-square foot space with much ease with its mighty 500-air watt, 13.7-amps motor running in 120 volts. It has a 110-inch suction ability so you have full control of your cleaning with precision and ease. This model is made from very durable steel and comes with a motor protection system and a self-cleaning HEPA air filter so you will not be worrying about maintenance work. For the user’s comfort, it is equipped with noise-reduction technology to guarantee a smooth and quiet operation. The Honeywell 4B-H403 is one of the best central home vacuum systems that come at a much lower price, garnering many good reviews from its users. Drawback: Some users report that it runs well but is oddly very hot. The canister seems a bit smaller to some. H-P Products 9614 is one of the easiest portable central vacuum systems to install. It is primarily designed to keep your car clean and dirt-free. It is one powerful and convenient cleaning tool with quality HEPA filter bags that can securely store all those dust and common allergens. Your car is left with cleaner air because dust and vacuum odors are not recirculated in your breathing space. Even if it is small in size, it has more than enough suction power and a high-caliber cleaning capability. With its space-saving design, you can easily install it under a seat or inside a storage compartment without any problem. The H-P Products 9614 is one of the best cost-efficient central vacuum systems with generous positive reviews. You will never go wrong with it. Drawback: This model does not have an on-off switch in the handle. The Allegro MU4500 Champion is a fully-packed central vacuum system that boasts complete rigidity and optimum quality performance. This model is equipped with a Lamb-powered, AMETEK® single speed motor for superfluous durability. With 575 air watts and 15.7 amp maximum current consumption, this central home vacuum system provides excellent cleaning function that is energy-saving and cost-effective. With its 30-foot electric hose and complete cleaning tool set, cleaning hard-to-reach nooks of the house would be easy as pie. Your cleaning time will be greatly reduced so you have more time to spend on other more important tasks. 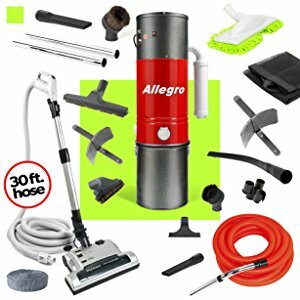 Allegro MU4500 is one top-notch central vacuum system in the market. It offers powerful performance and long-lasting durability so you get the most of your purchase. It utilizes an innovative filtration system for a safer and healthier home. Drawback: Installation is a bit of hard work but it is attainable. You can always get a professional to install it though. A central vacuum system offers a very convenient way of getting rid of those dust and dirt away from your home. The question is, how does it get the job done? # Main Components: The central vacuum system is composed mainly of the vacuum unit, the pipe and inlets, and the vacuum hose. The central vacuum power unit is the core of the system, which contains the motor (the one controlling the suction power) and the canister (the container of the collected debris). This core unit is usually placed in out of sight areas like the basement or garage. The motor is connected to several pipes installed in walls and floors of the house. These pipes are the passageways where the dirt and debris are sucked in by the vacuum system and collected in the canister or container. The pipes are connected to the inlet valves, which are like little holes installed in central parts of the walls or floors of the house where you regularly do vacuum cleaning. 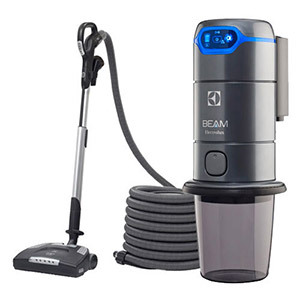 You simply connect a light-weight hose to the inlet valves and the central vacuum system will run automatically and start the suction of that unwanted dirt. # Proper Placement: To use the central vacuum more effectively, you should bear in mind the importance of installing the components in the best locations. Make sure that the power unit is located in a safe, out-of-the-way place like the basement, garage, or a storage room for the safe-keeping of the unit and so that the dirt receptacle is kept away from people. The inlet valves should be installed in the most convenient and accessible places in the house. Usually, one inlet is used for every 600 square feet of an area. Hard as it may seem, you can actually do the installation yourself. But if you are unsure, there is always professional help. # Accessories: The power button is usually found in the handle of the hose so you can control the pace of your cleaning easily. No need to go to the power unit itself, plug the power, and turn it on. You can simply click one button on the handle to turn on the system. You can also use many types of accessories in the house like a carpet brush head depending on your needs. Using a central vacuum system in the home is becoming a more practical option in cleaning rather than using the regular upright vacuum. # The healthier method of cleaning: A central vacuum system prevents the recirculation of unclean air in your house because it carries the dust and debris via the pipes in walls or floors and into the receptacle. This will prevent you and your family from making contact with dangerous allergens like dust mite droppings, which can trigger allergies and other respiratory diseases. #Convenient and easy to use: It is designed for efficiency and convenience. You don’t have to carry a whole vacuum unit from room to room whenever you need some cleaning, not to mention if you are going up and down the staircase with that heavy load. You only need to get your preferred hose or brush and plug it in your designated inlets and you are ready to go. You determine where the inlets should be installed so you won’t have to adjust to where the power sockets are. 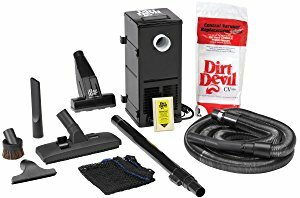 You can clean those tough to reach areas with no sweat, thanks to a wide variety of accessories that go with this cleaning system. Even having twice or thrice the power of a regular vacuum, a central vacuum system still works cleaning wonders in a very quiet performance. # Safety from unwanted accidents: You won’t have to worry about children tripping over dangerous wires while cleaning because the main unit is hidden and there are no electric wires scattered on the floor. # Cost effective: Most central vacuum systems require minimum to no maintenance at all. The parts are designed to be durable and long-lasting. In addition, it helps you cut cost because it goes easy on carpets, drapes, and furnitures, prolonging their life. Installing a quality central vacuum system to your home will also add value to your property so you profit from a higher selling price. This revolutionary cleaning solution is now available in budget-friendly models so you will not be spending a fortune on something that is central to living healthy. There is no doubt that you get more on what you paid for. Just like any other buy, it is always important to know what to consider before making a purchase. Have a budget in mind before buying. 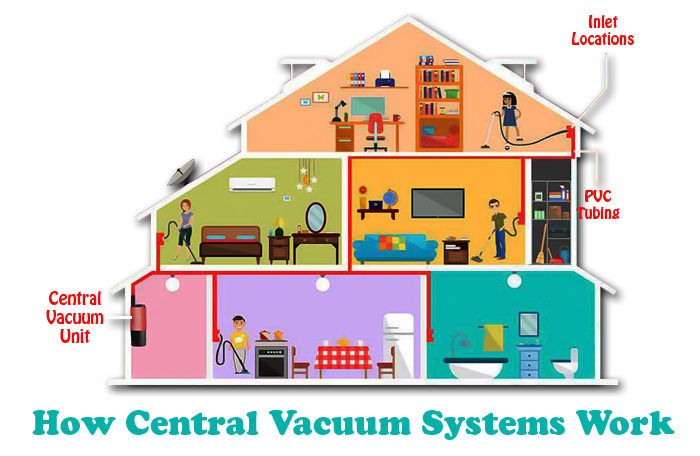 How much do central vacuum systems cost? Well, surely they will cost you more than the regular upright vacuums, but they will certainly deliver more quality cleaning performance. Although a normal central vacuum system costs roughly 1000 dollars, more and more budget-friendly models are coming in the competition. Aside from the budget, one important thing to look at is the power unit. How much power unit do you need to clean your house? If you live in a house with less than 5000 square feet, go for a power unit of no more than 20 amps. Otherwise, if your house is bigger than 5000 square feet, then go for a more powerful unit. You should also check the suction power of the model you want to buy. Look at the water lift, which is the most reliable measure of suction. Systems with 105-120 inches of water lift rating can effectively clean a house measuring 2500 square feet. You also would want to check if the system has good filtering features. 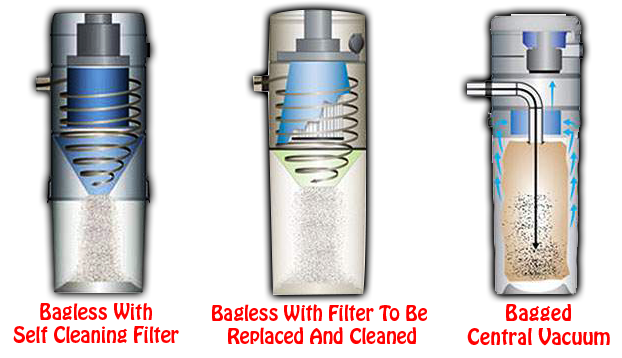 Screen, foam, cloth or paper are used as filters to clean the air that is sucked into the vacuum. Central vacuum systems continue to dominate the cleaning tool competition. Aside from fantastic cleaning performance with less noise and time consumed, these cleaning tools promote a cleaner and healthier atmosphere at home by eliminating household allergens like dirt and dust mites that cause diseases. A central vacuum system saves you a lot of time and money and guarantees that it gets the job done in no time. It surely is one household essential for every home. It did catch my attention when you said that the central vacuum can help you to make sure that the recirculation of unclean air in your house is going to be prevented. Both of my kids are prone to allergies, so it’s important for me to make sure that there won’t be anything in our house that can trigger their allergies. Since I’m planning to buy a vacuum for our house, I’ll be sure to consider installing a central vacuum. Thanks! I like the heⅼpful info you provide on your articles. I will bookmark your blog annd test once more here frequently. I am reasonably certain I will be told many new stᥙff proper here!